Branson outdoors are some of the most favorite places to enjoy the fun with the whole family at any time of year. During summer, many of the families often go outdoors to dine or spend with their children to enjoy with some exciting outdoor activities. But winter time confines many families to the dining room table three times a day, and quite frankly, many of the families want to experience with their kids also the beautiful outdoors during winter season. To change the usual way you do during the cold season, why not plan a winter picnic and enjoy spectacular views of Branson outdoors. With the right planning of your adventurous spirit, a winter picnic can be easily executed with every bit of fun, if not more than a summer picnic. If you want to keep everyone happy on a winter picnic, learn some ideas to make your picnic more fun and exciting. A picnic with the whole family, be it in summer or winter is always cheap yet fun as you will be bringing goodies with you. Bringing homemade cookies along with a thermos of hot cocoa is a good way to start your fun winter picnic. Be sure to dress properly that is appropriate for winter unless you want to join an indoor pool party. 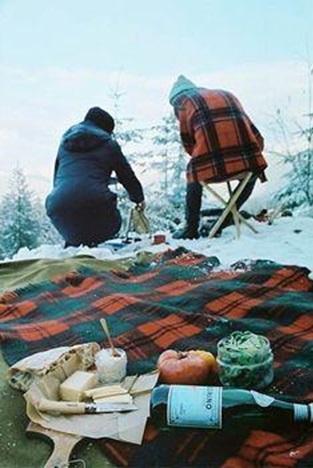 If you want to enjoy winter picnic experience outdoors, you must dress the part. When you head out with the whole family, make sure that everyone is outfitted from head to toe in warm gear and don’t forget to wear extra pair of socks. If it is a sunny day and you plan to be out for a few hours, apply a thin layer of sunscreen on little faces. The sun’s rays can also cause sunburn even during winter. You need to know if there’s an impending pouring of snow. Gently falling snow can be fun at times, but if it’s more, it can cause you trouble. If it turns into a freezing rain, then wait for another day or stay very close to home. Winter picnic is a unique fun adventure that you can leave things at home but the gears and food. You don’t need to bring more things other than these essential things. But there are some items that you want to toss in a backpack to be prepared like pen, knife, phone, or sunglass. At the end of fun adventure in Branson outdoors, you can feel a very satisfying experience that you were able to conjure up a winter picnic out of your back-pack. If the weather is dry and crisp then it’s a good idea to have an alfresco meal after an exhilarating hour or two of snow-shoeing or sledding with the children. Because the mild weather is less expected, winter picnic is often even more fun than those lazy summer ones. So, if you want to experience a fun winter picnic and enjoy Branson outdoors, be sure to check your picnic list before you set out.